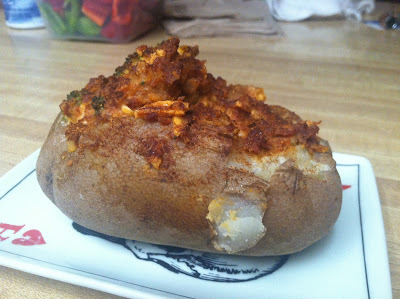 The Bad Kitty Bakery: Chorizo Broccoli Baked Potato with RECIPE! Sometimes, you just need a dinner that is a little sinful. After all, life is about being alive. That means that there are those moments when you want to go big, or go home. This twice baked potato is my creation for those moments. This uses soy chorizo. I recommend the brand from Trader Joes if you can get it. It is both delicious and inexpensive. I also used Tofutti Sour Cream, Earth Balance butter, and Daiya cheddar if you want the exact brands. Wash your potatoes and place on a cookie sheet. I also cover mine with foil. Bake at 350 degrees for 30-40 minutes until tender. Remove from oven and allow to cool enough to handle. Being careful not to go through to the other side, scoop out the middle of the potatoes, leaving a shell on all sides except the top. Place all the scooped out potato into a bowl then add the vegan chorizo, butter, cream cheese, cheese (shredded) and mash until light and fluffy. Carefully stir in the broccoli, then use the mixture to refill the scooped out potatoes. Replace them on the cookie sheet and bake at 350 degrees for an additional 20 minutes. Remove and allow to cool.